Islamic Jihad spokesman says the organization will continue to place the issue of prisoners at the top of its list of priorities. 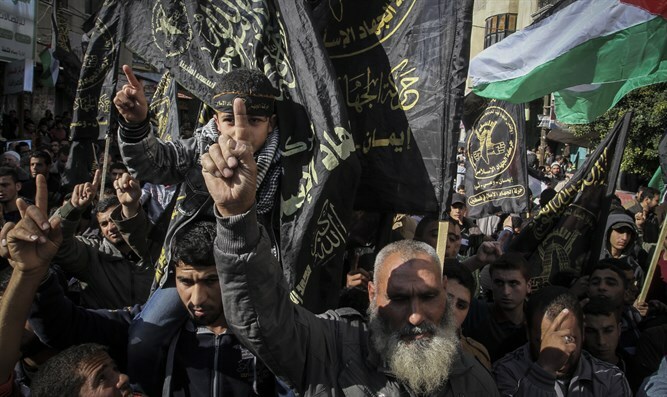 Abu Hamza, a spokesman for the Al-Quds Brigades, the Islamic Jihad's military/terrorist wing, said on Tuesday that the organization would continue to place the issue of prisoners at the top of its list of priorities until they are released from Israeli prisons. Speaking on the anniversary of the double suicide bombing at the Beit Lid bus station in January 1995, in which 22 Israelis were murdered, Abu Hamza said the Al-Quds Brigades would continue on the path of resistance. In a message to the Palestinian Arab public, Abu Hamza said that the Palestinian resistance forces are in good shape and will continue on their path at all costs. The double suicide bombing in Beit Lid was carried out by Anwar Soukar and Salah Shaaker, who were dressed as Israeli soldiers. Soukar was the first to blow himself up at the bus stop. Several minutes later, as rescue forces arrived on the scene and began treating the victims, Shaaker blew himself up in order to cause even more fatalities.